You can’t manage what you don’t measure! 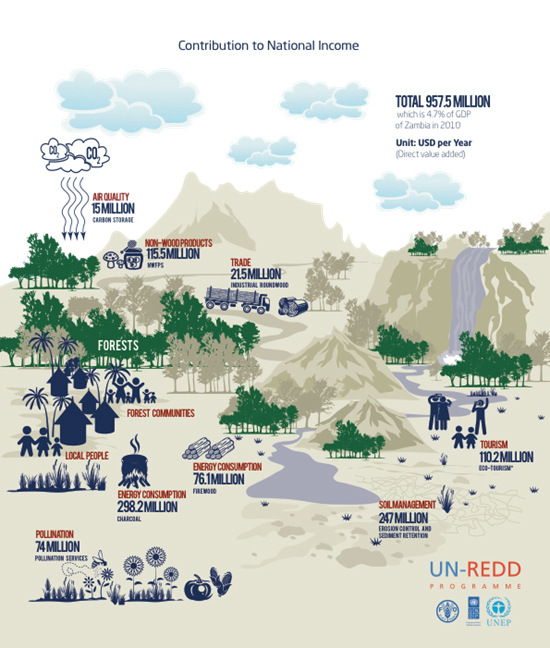 While this certainly relates to establishing forest reference (emission) levels and national forest monitoring systems in order to measure periodic progress against a benchmark, one often overlooked piece of the jigsaw puzzle is the economic case for REDD+. A major driving force of economic growth in many emerging economies is extraction of natural resources, both non-renewable resources such as copper, aluminium, oil and other minerals, metals and fossil fuels and to a lesser extent renewable resources like timber products. In the case of Zambia, the size of its economy was around US$ 20 billion in 2010 with the wholesale and retail sector (18%), followed by the mining (13%), construction (11%) and the agriculture, forestry and fishery sectors (10%) contributing the most to national income. However, in the words of Joseph Stiglitz, while a private company is judged by both its income and balance sheet, most countries only compile an income statement (GDP) and know very little about the national balance sheet. While Zambia’s income measured as GDP has been constant in recent years at above six per cent, its forest-related balance sheet has been depreciating steadily. It has the second highest per capita deforestation rate in Africa and the fifth highest in the world according to a 2009 study. The main direct drivers of deforestation are charcoal production, agricultural and human-settlement expansion and illegal exploitation of timber. Depreciation of a country’s forest stocks also leads to significant greenhouse gas emissions and can affect the value added of other sectors such as agriculture, power generation and tourism. The UN-REDD Programme has therefore supported the Government of Zambia, as part of its National REDD+ Programme, to better understand the contribution of forests to the national economy, which are highlighted in the report Benefits of forest ecosystems in Zambia and the role of REDD+ in a Green Economy transformation. First, in terms of the contribution of actual physical products, this study found that industrial roundwood, firewood and charcoal combined contribute about US$ 395 million per year to Zambia’s economy. In terms of non-wood forest products a wide range of plant and animal species are collected for use as raw materials in house construction, thatching and craft production, as well as for food and medicinal use. While much of this is used on a subsistence basis, these resources also contribute to household cash income, supplementing income from charcoal and timber. It is estimated that these resources combined contribute US$ 115 million to the national economy. The combined value of these products to Zambia’s economy is about US$ 511 million. Taking multiplier effects into account, the contribution is estimated to be US$ 761 million or 3.8% of the country’s GDP. This is in line with how the contribution of the forestry sector to national income is officially accounted for. Second, forests also provide important regulating services, which can help other sectors such as energy and agriculture prevent operational and other costs. For example, in terms of preventing erosion and stabilising soil, forests can contribute significantly to the hydropower and agricultural sectors by preventing dredging costs of sedimentation and water availability for agricultural production. About 80% of Zambia’s electricity is generated through hydropower, and globally, reservoir sedimentation has been estimated to account for about 37% of the annual operating costs. Preventing sedimentation by ensuring that forests keep the soil together is estimated to generate an actual cost saving to the Zambian economy of US$ 247 million. Forests also contribute to the value added of the agriculture sector through pollination. The value of pollination services was estimated based on the output of crops, their degree of dependence on insect pollination, and the costs of alternative means of pollination obtained from the international literature. The value of forest pollination services was estimated to be in the order of US$ 74 million per annum. The contribution of carbon sequestration was measured using the damage cost approach. Damage cost relates to estimating the cost (to the global economy) of emitting 1 ton of CO2-equavalent. Preventing this from happening by reducing deforestation and forest degradation contributes about US$ 15 million per annum to the Zambian economy. Lastly, nature-based tourism is the dominant form of holiday tourism to Zambia, and forests are an integral part of the nature-based tourism experience. The direct value added by forest-based tourism is estimated to be in the range of US$ 110 million to US$ 179 million per annum. The total contribution of this second set of forest services is of US$ 446 million. Again, by taking into account multiplier effects the contribution is estimated at US$ 511 million or 2.5% of GDP. The contribution of forests to the income generation of productive sectors such as ecotourism, hydropower, and agriculture is usually not attributed to the forestry sector and therefore not included in the forest-related GDP. However, this study clearly found that if these regulating, supporting and cultural services seize to exist or are undermined, a series of measurable and physical costs will apply to these sectors in the medium to long term. One could therefore argue that depending on the estimate of the contribution of forests to GDP in Zambia, which range from 3.7% to 6.2%, there is an undervaluation of at least 40-68%. Besides, this discrepancy could be even higher as data were not available for many goods and services. For example, the contribution of forests to the provision of water quantity and quality in Zambia remains unaccounted for and directly impacts livelihood and key sectors of the economy such as mining and agriculture. Taken all together, this study provides a clear rationale for Zambia’s newly installed government to accelerate REDD+ implementation because it makes macro-economic sense for the country itself. Forest valuation and accounting can be seen as an important door opener that paves the way for the government to develop concrete policy options that factor the contribution of forest ecosystem services into national accounts and development planning. The draft Zambia National REDD+ Strategy provides important guidance on how this can take place through its focus on a landscape approach at the watershed level and policy reforms at the national level that lessen the competition for natural resources among different sectors. The results-based payments framework agreed under the UN Framework Convention on Climate Change provides a crucial stimulus for the country to implement policies and measures that tackle both the direct and indirect drivers of deforestation in order to have the ability to receive results-based finance.